The first decades of the 20th century had brought quite a few significant changes for Lithuania. After the independence was regained in 1918 and the fights for independence subsided, Lithuania started experiencing the influence of Western cultures. After the Bolshevik coup d’état in 1917 the border with Russia was walled up, as was with Poland after it occupied Vilnius and its district in 1920. Lithuania had lost its historical capital Vilnius. Kaunas became the provisional capital of Lithuania. Growth of Kaunas, a small town of the northwestern province of Russia, was for a long time hindered by the defence forts and Russian laws. Lithuania had to reinvent not only its state but also its provisional capital city in a virtually vacant historical space. The 1920s-30s saw the development in economy: bustling industry and trade, Kaunas became a city of trading corporations’ headquarters, new living residences, banks, theatres, cinemas, elegant restaurants and cafés. Technological advance and aspiration for higher living standard prompted the sequence of significant changes. Kaunas welcomed every new trend. Little by little Lithuanian, albeit somewhat Americanised, city culture was formed. That was new, for in the previous historical period with mostly non-Lithuanian city residents the Lithuanian city culture did not exist. The entertainment became an idiom of the new world – the element of folk entertainers, comedians, circus artists and outstanding autodidact musicians. Hitherto, in Lithuania, ranked as a province of Imperial Russia, public entertainment establishments were limited to gloomy taverns. 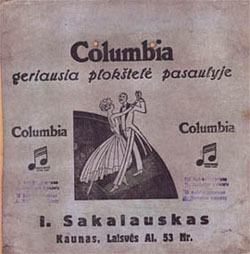 In interwar Lithuania, the entertainment music could be heard only in restaurants, cafés and cinemas. It was performed on a podium – a small raised platform called “little stage”. This term took root. The entertainment music (the term estrade-music, Fr. estrade – a raised platform, was contrived later) was not allowed neither to opera theatres nor concert halls. And that was a requirement of cultural-social life not only in a young Lithuanian state. In Europe the entertainment industry had established these limits a lot earlier. In early 1920s, affected by volte-face in politics the artists from St. Petersburg, Moscow and Kiev, European cities and even from the USA found their place in Lithuania. Kaunas became a refuge place also for musicians from Poland-occupied Vilnius. 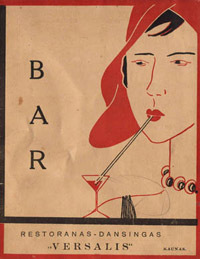 Restaurants’ and cafés’ musical programmes were influenced by the music and exponents of other cultures such as Russian, Gypsy, Jewish, Romanian and German. Various foreign musicians appeared in Kaunas including French ensemble Sisters B, Spanish Carmen and Celina Aso, Hungarian duo Balwy and Bady, Romanian violinist J. Gulescu, mulatto Fortuna la Creole, Hungarian pianist Denes Laszlo, Russian pop star Alexander Vertinsky, etc. Kaunas also hosted a performance of Swedish ensemble including the celebrated black singer Josephine Baker. According to contemporaries, in the evenings it was not easy to realise one’s whereabouts – it could have been St. Petersburg, Warsaw, Berlin or Paris; in many places there was not only sung but also spoken Russian. Cinemas and cafés were the venues for amusement of affluent ones. Kaunas residents liked to spend time in new and stylish restaurants. The then press wrote, that great crowds would gather to Metropolis, Versalis, Lozana, Monika, Aldona, Rambynas, Centralinis Restoranas, Pale-Ale, Božegraika and Konradas Café for the entertainment programmes (so-called music sessions). The little stage attracted connoisseurs of cafés and restaurants. The most popular restaurants were located in the city centre, on the Alley of Freedom. The most moneyed-ones favoured Metropolis, which drew high state officials, diplomats, and was the place for the grandest carnivals of the provisional capital. Up to the late 50s it was the stage for Moishe Hofmekler’s Metropolis orchestra, dubbed as Hofmeklerband. The orchestra accompanied many an artist of little stage including Antanas Šabaniauskas, Daniel Dolski, Antanas Dvarionas, Stepas Graužinis, Jonas Byra and his quartet, as well as touring guests. Hofmekler’s orchestra performed schlagers by Kajetonas Leipus, Leonardas Lechavičius, Juozas Bankas, Stepas Graužinis and N. Naikauskas, as well as classical works by Juozas Pakalnis, Stasys Gailevičius, Juozas Tallat-Kelpša, Stasys Šimkus and Juozas Gruodis. 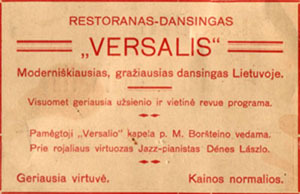 Versalis was regarded as the most modern and beautiful restaurant-dancing in Lithuania. Young folk preferred Pale-Ale, which, according to contemporaries, was the place for those who wanted to get on a spree. Kaunas’ bohemians gathered in Konradas Café, a Lithuanian version of Closerie des Lilas. Poets, artists, actors, opera soloists, architects and writers would spend long hours there. 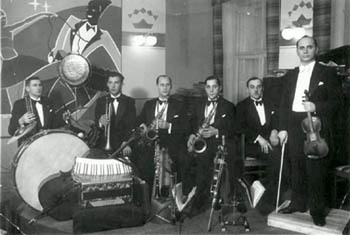 Around 1933, the café became the rostrum for Daniel Pomerantz’s ensemble. Moreover, the Press banquets organised by the Lithuanian journalists also earned a glory and gave a start to a new tradition. The first banquet was held in 1929 on occasion of the 25th anniversary of lifting of the Lithuanian press ban. In fact, the entertainment music was sung almost exclusively in Lithuanian. Foreign schlagers were fitted with Lithuanian translations made by leading Lithuanian poets and literary artists Ričardas Mironas, Vladas Misiūnas, Adelė Lenartavičienė, Stasys Santvaras, Feliksas Ramonaitis, and Petras Babickas among the others. Many texts were written by the performers themselves including Daniel Dolski, Jonas Byra and Vladas Sipaitis (Sipavičius). Noteworthy was Petras Biržys, an extremely popular artist, musician, singer and storyteller also known as Pupų Dėdė (Uncle Bean), as well as entertainment-company Linskmieji Broliai (Jolly Brothers) formed around 1928. The nucleus of the company involved young actors from the State Theatre, operetta singers Viktoras Dineika and Jurgis Petrauskas. Details of Stasys Gailevičius’ male vocal sextet Šeši Vėjai (Six Winds) are scanty. Democratic novelties – film and music recording – have greatly influenced the spread of new artistic expression forms. In 1924, recording label Odeon, and in 1931 Columbia, having brought recording equipment to Kaunas, started recording local musicians and opera soloists, as well as inviting them to recording studios in Copenhagen, London and Berlin. Abroad our soloists shared the stage with the celebrated George Scott-Wood band, Columbia dance orchestras and other collectives. In the 1930s, record label Homocord, one of the most influential recording companies in Europe with its own agents in Kaunas, recorded a great number of schlagers performed by Lithuanian soloists. Homocord’s releases feature the name of Josif Stupel. He conducted the orchestra formed specially for these recordings. Recorded music in Lithuania was very popular and willingly purchased although the records were comparably expensive. 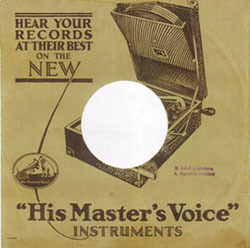 In addition to the aforementioned labels, the Lithuanian performers recorded for Zonophone Records, His Master’s Voice, Victor, Polydor, Parlophone, Artiphone (later released Lithuanian Series), Pathe, Brunswick, Vox, Kristal, and Bellacord Electro. In 1925, French company Société française radio-électrique built a radio station in Kaunas, which in a year started broadcasting as Kaunas Radiophone. Radio and recordings brought to Lithuania previously unheard rhythms of tango, foxtrot and Charleston, up-to-date European schlagers, and popular melodies from musicals and films from around the world. The Lithuanian musicians had a lesser stage experience than touring guests, but despite of that an impressive number of Lithuanians joined the vortex of novelties before long. A few years later the head of Kaunas District and City Police (!) announced strict regulations according to which one-sixth of the music presented on little stage (wittily dubbed ‘police numbers’) had to be performed in Lithuanian and, moreover, it had to be of “folk character”. The same rules applied for recording artists as well. With the expansion of totalitarian regimes from the East and the West at the end of the 30s, many of Lithuanian artists and musicians were deprived of creative freedom. Moreover, they suffered an undeserved disdain and tendentious depreciation for many years. 1940 saw the establishment of the Lithuanian SSR State Philharmonic Society, where in the following year the competition for estrade-music performers was held. Led by Abraom Stupel, the Kaunas Radiophone orchestra existed up to 1941. The orchestra formed by saxophonist Jakovas Šabsajus and led by Romanas Marijošius retreated to Russia during German occupation (performed until 1944). In post-war period, Kaunas drew artists and musicians who stayed in Lithuania despite the political metamorphosis. The music life started slowly regaining its pace. However, the “Iron Curtain” was separating Lithuania from the world. Konradas Café (after reconstruction – Tulpė) again started hosting evening performances. Led by Jonas Lechavičius, Kaunas Radiophone ensemble enjoyed popularity. It was modish to give a performance in cinemas before the showing. Collectives of entertainment music were formed in Klaipėda and Šiauliai. In 1955, an amateur big band was established in Kaunas Polytechnic Institute. The orchestra started without a leader, and later, urged by musician Alfredas Krutulis, Juozas Tiškus, a graduate of Juozas Gruodis music school, accordionist, keyboardist, arranger and composer, stood at its helm. The orchestra made its debut in spring of 1955. In 1957, the orchestra was granted the status of Youth collective of Kaunas city culture department, took part in the Sixth Festival of World’s Democratic Youth and Students in Moscow, where it performed composer Benjaminas Gorbulskis’ specially written boogie-woogie paraphrase – a daring deed for the time. In spring of 1958, the decision was made to form a professional collective and Juozas Banaitis, the Minister of Culture, issued a decree according to which the Lithuanian Estrade Orchestra (LEO) was established in the State Philharmonic Society. The core of the orchestra consisted of Juozas Tiškus’ musicians. 1958 saw formation of yet another collective – the Lithuanian Radio Estrade Orchestra under the direction of Jonas Vadauskas. After joining the Philharmonic Society, Juozas Tiškus’ orchestra commenced intensive touring. Due to shortage of professional musicians, the orchestra was gradually formed from the best musicians of the then Soviet territory. The orchestra involved musicians of 7 nationalities: one Czech, several Belarusians and Ukrainians, musicians from Leningrad and Moscow as well as the leading Lithuanian instrumentalists. Progressively, the LEO became one of the finest orchestras in the former Soviet Union, compared to Oleg Lundstrem Big Band. The concert programmes were divided into instrumental jazz compositions, and Lithuanian and foreign light music. The concerts often involved vocalists, dancers and comp?re. The LEO’s success encouraged formation of Šiauliai Building Trust (leader Teisutis Saldauskas) and Kaunas Oktava big bands, as well as Nemuno Žiburiai orchestra, which later was known as the Lithuanian Estrade Ensemble. In 1960, the Lithuanian Composers’ Union inaugurated the pop music department, which until 1980 was headed by Benjaminas Gorbulskis. 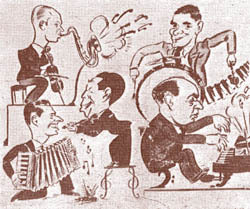 The LEO and other collectives inspired a number of composers including Benjaminas Gorbulskis, Mikas Vaitkevičius, Mikalojus Novikas, Teisutis Makačinas and Vygandas Telksnys. Due to line-up changes in 1966, the LEO was reformed into Estradinės melodijos ensemble which was active until 1986. In addition to aforementioned composers, the ensemble performed works by Algimantas Raudonikis, Alvydas Jegelevičius, Galina Savinienė, etc.